About six years ago, my husband and I read William Forstchen's novel, One Second After. It was recommended to us by one of our neighbors, and boy, was it eye-opening! Not being preppers at the time (and actually having no idea what one was), we really hadn't given much thought to any kind of emergency preparedness beyond the typical flood or heavy snow. But this terrifyingly realistic fictional account about what a family experiences after the grid goes down due to an EMP (Electro-magnetic Pulse) made us sit up and take notice---and our preparedness journey began in earnest! For the record, William Forstchen is not some kook. He has worked in Federal Government agencies that deal with this topic and has extensive knowledge. The introduction was written by Newt Gingrich who discusses (among other things) the fact that the electronics grid in our country has not been "hardened off" adequately since the years of Ronald Reagan in the early 1980's. Frightening stuff, especially after reading One Second After and obtaining a glimmer of understanding of the potential ramifications of this kind of catastrophe. When I mention our emergency preparedness efforts to folks who are not educated about the potentiality of an EMP, either from the sun or via a terrorist attack, responses vary. Some are interested, some are incredulous, some are skeptical, and some (closed-minded) folks are downright rude. Just saying. In my world, an intelligent person doesn't shut another person down due to ignorance. One of the things that annoys me more than anything is for someone who has NO information whatsoever about a topic to close their mind, shut down their thinking, and turn their minds off. The decision to act this way could be deadly! It behooves us all to do our due diligence before making a snap decision about whether something is "true" or not. Regardless, ALL of us should be responsible for making sure we have at least a two- to three-week supply of food, water, and medical supplies on hand in our homes. Anyhoo----After reading One Second After together, Mr. V. and I began our prepping education in earnest. Like most people, we decided to start with food. Well, I guess I decided to start with food. Mr. V., like many men, was more in tune with our defense. So my personal big questions became: How do you start preparing for emergency food storage? What kinds of foods should you have? How do you know when you have enough? Do you ever have enough? I wrote this article with the complete beginner and newbie to long-term food storage in mind. But even if you already have food storage going on, I recommend taking a look because I have found that everyone's opinions differ. It's a really good idea to have a broad view of the topic, then make your own decisions. Is your food storage ready for an emergency or disaster situation? Here’s how (and why) you need to get your food storage plan going NOW! Find out the 20 items you should have stored in bulk PLUS considerations for your own family’s personal food storage needs. Here’s how you can get started storing food for an emergency situation or disaster. Deciding what foods to store away for a crisis is really not a simple decision. Since you don't know what kind of emergency you're storing food for, you really need to assume the worst case scenario: That you won't be able to go to the store for anything. I could go into all the potential things that could create this kind of situation, but that's for a different article. Having good food storage is not about buying cases of Doritos or any other processed foods. In fact, those types of foods don't store well and have a relatively short shelf life. Also, the packaging is terrible and attracts bugs and rodents. Also--if you are not into baking from scratch, or your kids don't like vegetables, then perhaps it's not the greatest idea for you to buy and store up a huge amount of hard red wheat that needs to be ground by hand, as an example. If you know your family hates beans, then don't buy them. You want to give some thought to the foods that will have a relatively long shelf life that you can truly find useful in making meals for your family. Many people freeze foods and consider that type of food preservation food storage...however, for preparedness, freezing your foods may not work for long. In the event of a power outage or the grid being completely down for any length of time, you really need to think about having foods on hand that don't require refrigeration. We didn't have an emergency, but we lost ALL our frozen meats, vegetables, and fruits during our move to a new homestead. It was seriously the saddest thing. Just depressing. For long-term food storage, you'll want to consider ALL kinds of food preservation methods: dehydrated foods, freeze dried foods, canned foods, naturally fermented foods, and frozen foods too. You want to keep foods on hand that will provide the maximum calories and nutrition for the space they are taking up. You should also consider usefulness: Can you use the food item in a variety of different ways? For example, coffee is a pleasure item. But it doesn't serve multiple purposes, and it certainly doesn't have nutritional (and caloric) value. It's great for morale, but that's about it. I'm not saying coffee is something you should leave off your list (and it's included in my personal list, as you'll find out in a moment), but is it worth the space? Storing food for the long-term and for emergencies is truly a set of personal decisions that need to be made specific for every family and situation. What are Basic Must-Have Foods You Should Have in Your Own Emergency Storage? **Note: I'm not going to give you specific amounts, because you'll need to think about how many people you are storing food for. Obviously, the needs for a family of five will be different than those for a small family of two. It also depends on the time frame you have in mind for your food storage. Are you storing for three days? Six months? A year? Now on to my food storage list to help get you started! Choose vegetables such as tomatoes, corn, green beans, etc. that can be used in simple recipes. Canned vegetables will also contain nutrients you need. The liquid can be used for cooking too, and it will retain those nutrients! Especially if you have children, keeping canned fruits helps out for the happiness factor. Like canned vegetables, canned fruits will also contain healthy nutrients. Stock piling canned meats is SUPER important because you may find that good sources of protein necessary for sustained energy might be hard to come by. Tuna, salmon, chicken, anchovies, and others are good choices. Notice, I left out SPAM (YUCK), but even that or Vienna Sausages would be useful. You can even can your own meat if you use a pressure canner. The modern pressure canners out these days are very safe and work great. I currently do not have a pressure canner (that's hopefully my goal this summer if I can swing the cost), but I have heard wonderful things about the All-American Pressure Canner. This brand is a lot more pricey than the T-Fal Pressure Canner or the Presto Version, but I use something I've dubbed "The Misty Principle" to decide how to purchase expensive items that need to last. Canned meat is GREAT to have stored up. My mom canned this fresh salmon from the Umpqua River two years ago---It's still good. We have an Excalibur Dehydrator, and all summer it's going, dehydrating vegetables, herbs, and fruit for later use. If you run across vegetables & fruits on sale at the store, you can grab some up and dehydrate those if you don't have your own garden! It's a great thing to see rows of dehydrated foods lined up in Mason jars. Using dehydrated foods is also a great way to have access to foods out of season too! The initial expense seems kind of high, but I have never once regretted our purchase of a nine tray Excalibur Dehydrator. If you don't want to dehydrate your own foods, you can buy freeze dried foods. Or check with Deseret Industries--they have locations where you can purchase large No. 10 cans of dehydrated foods, including potatoes, carrots, celery, onions, and more for really GREAT prices. I think they ship, too! Other options include raisins, cranberries, prunes, apricots, and lots more! One item you'll need if storing dehydrated food in Mason jars like I do is Oxygen Absorbers. These actually help seal the jar as the oxygen gets absorbed and are a very inexpensive necessity for dehydrating fruits & veggies. Jerkeys, meat protein bars, meat sticks, summer sausages, etc. are additional ways of storing meat for that all important protein source. I haven't tried this, but I have heard you can toss jerkys and other dried meats into stews or other liquids you are cooking to help flavor the meal and soften it up too! Here's one of my most favorite snacks, and I try to keep these in our store room: Epic Bars! They come in lots of flavors, and you can get them on Amazon for much less than in the stores. You should keep several containers of dried beans on hand (IF you like beans, that is). You can get all fancy with your beans, but your basic Pinto beans are really inexpensive and delicious too! **If you don't want to keep dry beans for whatever reason (like if you don't like or know how to cook them), canned beans are also great---just keep in mind they'll take up a LOT more space. I'll have an article soon about how to cook dried beans perfectly! Dehydrated fruits and vegetables last a really long time! And it's SO easy to dehydrate your own food. Many families on a strict budget do quite well eating beans and rice! Together they are supposed to make a complete protein source, too. Regardless, rice is one of those items you can add to just about anything, change it up with spices, and make some really great creations! White rice stores best, but brown rice provides more nutritional value. I decided to keep both on hand, and I mix them. It always turns out great! Yummy pasta! Pasta lasts a long time if stored properly, and like rice, it can be cooked in many ways to change up your diet. Just make some easy sauce using some of those canned tomatoes, spices, and maybe some of that jerkey---You've got a pretty tasty meal! I have whole red and white wheat stored away from Deseret--lots of it. But when I started giving it some thought, I realized I would need something to grind it with. What if the power is out? So, I purchased an inexpensive hand grinder from Amazon. If you don't want to store whole grains, you can store flour too. However, flour degrades faster than whole grains. Just some things to keep in mind. Other grains you should store include rolled oats and quinoa (really a seed, but treated like a grain). I'm just going to lump these all together in this category. Be sure you have plenty of baking soda, baking powder, salt for baking, yeast (keep the expiration date in mind) on hand! Pretty much all the things you typically use to bake, you'll want to have a bit extra of. I buy my baking soda in bulk from Costco because not only do I use it for baking, but it is exceptional for cleaning and many other purposes around the home. I gave powdered milk its own section because it serves so many purposes. Although it doesn't taste that great, you can certainly drink it, add it to your oatmeal, and also use it to bake with. Spices can make a bland meal taste gourmet! You can buy bulk spices at Costco, Amazon, or Starwest Botanicals (highest quality and lowest prices). Here are some spices to always have: Chili Powder, Smoked Paprika, Oregano, Thyme, Rosemary, Garlic, Onion, Cayenne, Turmeric, Curry, Jerk seasoning, and so many more. Don't forget Salt and Pepper! Bouillon granules are also great to keep on hand. We store broth, but in case you run out or don't have any, you can make some great broth with a little chicken or beef bouillon. Honey is best--especially if it local and raw. It lasts a long time, and can also be used medicinally. Also consider cane sugar. You can purchase large No. 10 cans from Deseret or bags from Costco. Those are the two best basics, but you might also want Molasses, as well as Maple Syrup (although it needs refrigeration once opened). You can make your own with flour, baking soda, etc., however, if you have large bulk boxes of pancake mix, it makes life a little easier. Keep in mind the rancidity factor, and be sure to rotate your oils. I store organic olive oil, avocado oil, and coconut oil, just in case. And because I love making my own salad dressings, I like to keep a bit of extra Walnut, Sesame, and Sunflower oils too. You can't go wrong with powdered peanut butter! It's now available at Costco too! Nuts are GREAT to have on hand, but like the oils, you need to be sure to rotate because their shelf life is not that great. Sunflower seeds, flax seed, chia seed, and hemp seed and more are also great if you are into health and want to be sure you have the extra nutritional value. All these will go rancid over time, though, so just be aware of that and be sure to use up the older nuts first. Good food storage uses the "First in, first out" system. There are some people who just have to have their coffee! And tea! (Ahem.) So, I make sure we are always stocked up. I'm not a fan of tea bags, but if you don't want to deal with loose leaf herbs, then tea bags are a way to keep your tea. You'll need to plan for a good rotation cycle to avoid it going stale. One thing to note about coffee and tea: You can argue that there is a medicinal value in these items, but they really aren't great for nutrition in a hunger situation. But with that said---there is always morale to think about. If you are getting worried and depressed about a situation, sometimes the best solution and a real life saver is a simple cup of coffee or tea. They also make excellent barter items. Nutritional Yeast is a GREAT cheese substitute, tastes really good, and is chock-full of nutrition, especially B vitamins. It's already dried, and will last a good long time! Even if you don't drink, alcohol is a good food item to have on hand. If you learn to make tinctures, you'll be needing alcohol. If you have a person in pain from an injury, a little dose can really help. Like coffee and tea, alcohol is also an excellent barter item. I like to keep several gallons of white vinegar, as well as raw apple cider vinegar on hand at all times. Vinegar can be infused with herbs, has medicinal uses, cleaning uses, and is great for cooking and making dressings. If you read my newsletter, then you know how big I am about learning new skills. Every single time you learn something new, you invest in yourself and your value in the world. I'm serious. Anyway, if you'd like to find out how to make your own raw apple cider vinegar, you can do it yourself and save the high store prices! Related to vinegar, are fermented foods. 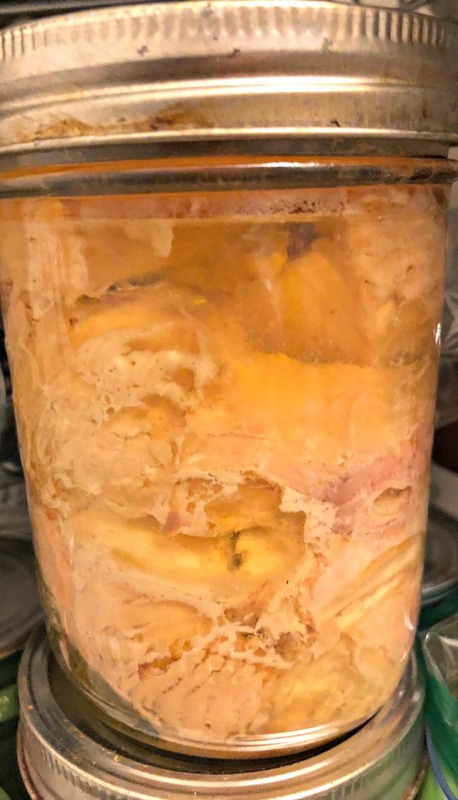 I made this fermented hot sauce that yielded about two gallons once combined with vinegar---It lasted months! It would have lasted longer, but we love our hot sauce around here! :-) You can find out how to make it right here. Obviously, if you are like most people, you are not going to be able to run out and buy everything all at once. It just isn't affordable for most people. But you'd be surprised at how quickly you can get a good little stockpile of food items stored up with just a few dollars and some planning each week. This list is certainly not comprehensive. You could consider adding fermented foods (if you have a cold room) and many other items not mentioned. You'll start figuring it all out once you get going. If you are interested in learning about fermenting foods for storage, take a look at: How to Make Fermented Jalapeño Rings, How to Ferment Cranberries, Make Fermented Tomatoes (A Traditional Russian Recipe), How to Make Your Own Herbal Ale, and many more! Is It Possible to Be a Minimalist Prepper? Do you store food for emergencies? How did you start, and what do you keep? I'd love to know your thoughts! P.S. Don't forget to sign up for our newsletter! You'll get my free gifts and resources when you do! And of course, you can unsubscribe at any time. May 22 How to Make Fermented Asparagus Pickles: A Spicy Springtime Recipe You'll Love!